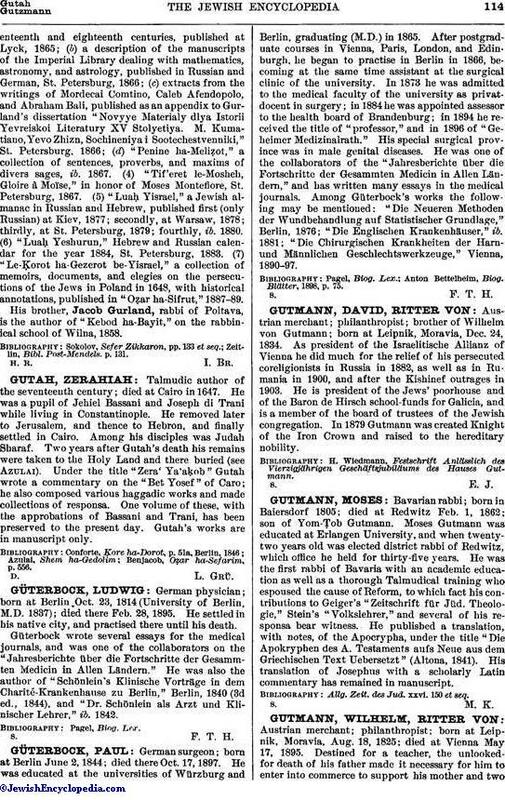 Talmudic author of the seventeenth century; died at Cairo in 1647. He was a pupil of Jehiel Bassani and Joseph di Trani while living in Constantinople. He removed later to Jerusalem, and thence to Hebron, and finally settled in Cairo. Among his disciples was Judah Sharaf. Two years after Gutah's death his remains were taken to the Holy Land and there buried (see Azulai). Under the title "Zera' Ya'aḳob" Gutah wrote a commentary on the "Bet Yosef" of Caro; he also composed various haggadic works and made collections of responsa. One volume of these, with the approbations of Bassani and Trani, has been preserved to the present day. Gutah's works are in manuscript only. Benjacob, Oẓar ha-Sefarim, p. 556.